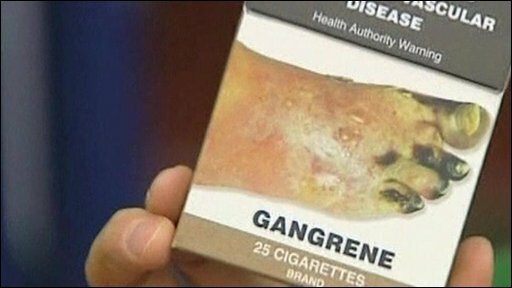 Prime Minister Kevin Rudd: "The cigarette companies will hate this measure"
Australia has set out plans for new rules forcing tobacco companies to use plain packaging carrying graphic health warnings. From July 2012, manufacturers would be required to drop all colour and branding logos from cigarette packets. The move, billed as a world-first, comes after recommendations were made by the World Health Organisation. Australia also announced a 25% increase in tax on cigarettes, effective from 0001 on Friday. The move will put A$2.16 ($1.99, £1.31) on a pack of 30 cigarettes. Smoking kills 15,000 Australians every year and is the largest preventable cause of disease and death in the country. Prime Minister Kevin Rudd, who is to hold elections this year, aims to cut smoking-related deaths to under 10% by 2018. He said his government made no apology for the measures. "Cigarettes are not cool, cigarettes kill people," he said. "This will be the most hard-line regime for cigarette packaging anywhere in the world." But a spokeswoman for Imperial Tobacco Australia said that the company planned to fight the measure. "Introducing plain packaging just takes away the ability of a consumer to identify our brand from another brand and that's of value to us," Cathie Keogh told Australian broadcaster ABC. Health Minister Nicola Roxon said the legislation would be carefully worded to withstand legal challenges from tobacco companies. The law will require all tobacco products to be sold in a standard colour and style, and carry government health warnings. It follows regulations on tobacco advertising which have helped cut smoking significantly, from 30.5% of the population aged 14 and over in 1988 to 16.6% in 2007. The tax hike comes a day after the New Zealand government announced it would raise cigarette taxes by 30% over three years.